Boarding is available for all breeds, 365 days per year. Our kennel has four separate heated indoor housing areas. We generally group our guests in different sections by size for safe group exercise outside. All dogs have individual kennels unless you specifically ask that your dogs live together. Family dogs living together must be able to eat compatibly. For dogs that need to be separated for safety at mealtime or to give a slow eater enough time, it will be necessary to reserve 2 kennels. Checkout time is noon. Your pet is welcome to stay until the afternoon on pickup day if you so desire. Afternoon pickups are $10 per dog. Holidays and Sundays Pickups and drop-offs are available by apppointment at 9 – 9:30 AM or 5 – 5:30 PM only. A $10 charge applies to all arrivals and departures on Sunday or a holiday. Special Pick-ups or Drop-off after hours: $25 minimum charge. Click here to be taken to the online reservation form. A 50% non-refundable deposit is required for all first time boarding clients. This deposit must be paid at the time the reservation is made. Advance reservations are helpful, especially around the holidays as kennel space is in high demand. On the following major holidays, a minimum 2 night stay is required: Christmas, New Years, 4th of July, and Labor Day. As we are closed on these days, no pickup or drop-off is available. Last minute reservations during holidays will require full payment in advance. Cancellation in advance is also appreciated. If it is necessary to cancel or change your pet’s reservation, please give us a minimum of 48 hours notice, so that we may have an opportunity to reserve that space for another guest. We do not overbook. Reservations are made based on information provided by you. Once your pet is dropped off, we plan for your dog to stay until the scheduled pickup day. If you choose to pick up your pet early without notice, charges will apply for time used, plus one additional night. If you need us to care for your pet longer than anticipated, please advise us as soon as possible. Current immunization records are required for all dogs. Records may be provided at the time of drop-off or mailed to us if that is more convenient. If you are coming from out of town, please have records sent ahead of time in case we need to contact you with any concerns regarding your dog’s records. If your dog stays with us regularly, please be sure to keep all records up to date. We realize that many people prefer to give their dogs immunizations themselves. While it is mandated by state law that the rabies vaccination be given only by a licensed veterinarian, the others may be administered by the owner. If this is your preference, please provide clear and organized records with accurate dates. Puppy folders with dates and checkmarks will not be accepted. Veterinary quality flea/tick preventative is required for all pets. Dogs are fed twice daily. We can either follow your dog’s usual diet with food from home or introduce your dog to our kennel food. We recommend sticking with what your dog normally eats at home, provided they like it and are doing well. If your dog is not doing well on his current food or you just feel the time has come to upgrade to premium nutrition, we would be happy to consult with you. We use Taste of the Wild (R), a grain free, protein rich dry food. Even picky eaters love this outstanding food and it is a great tool for us to induce a fussy dog to eat. Warning: Your dog will probably not want you to switch back to the old stuff! Please bring your pet’s food in a container with a lid. Plastic bags tend to rip, usually in the driveway, spilling food everywhere. Special diets are no problem. We are able to give every pet in our care plenty of attention and meal time is no exception. Raw Diet Friendly!! We feed our personal dog a raw meat diet and we are happy to do the same for your dogs if they are already on a natural diet. You provide the food and instructions and we do the rest. Refrigerated food storage is available. The health and safety of your pet is a top priority for us. The boarding agreement contains a section that gives us permission to seek professional veterinary care for your pet if we feel it is necessary. We will attempt to use your regular veterinarian if possible, if not we will use the veterinary clinic of our choice. When possible, the charges will be put on your account. If not, an invoice will be provided at checkout time. All charges incurred by Centralia Pet Resort for veterinary services for your pet must be paid at checkout time. Medications that can be given with food or treats are done at no charge. Ear and eye medications are also given at no charge unless it requires more than one person to apply the medication. In that case, the fee will be $1 per application. Situations involving more extensive work such as wound care, bandage changing or physical rehabilitation exercise will be discussed on an individual basis. If your dog is on medication, we ask that you supply enough for the planned stay, plus a few extra in case of alterations to your travel plans. We exercise the dogs 3-4 times per day, year round. As we are located in the Pacific Northwest, your dog will occasionally get the benefit of an all natural rainwater rinse. For dogs on longer visits, the owner may wish to add extra group play or training. Boarding dogs may be added to the daycare play group for $7 per day. See Scott or Gail to set up a schedule for your dog. Depending on your preference, dogs can be exercised individually, in family groups or integrated into carefully designed play groups. Special attention is always given to puppies as they learn to get along with other dogs. Many dogs like to play with toys while in their kennel. Be sure to select very safe and sturdy toys. NO RAWHIDES ALLOWED. If we notice that the toy is being destroyed, we will remove it to prevent the dog from ingesting something that could cause an obstruction or other health issue. Bedding should be machine washable and moderate in size. Foam dog beds are not encouraged. Each kennel has an elevated bed platform for comfortable sleeping. Marking your dog’s toys and bedding will help us make sure everything goes home in one trip. 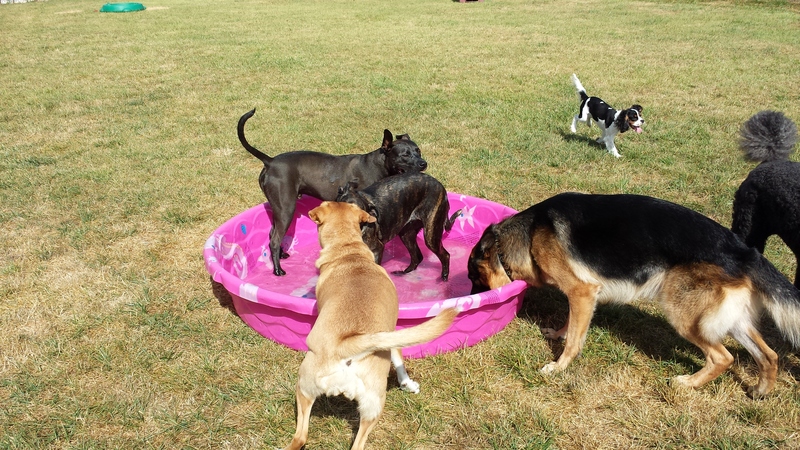 We offer several types of extra activities for your dog during their stay at Centralia Pet Resort. From quiet, peaceful walks in the park to high energy obedience and agility workouts, we have something for almost every type of dog. This is especially useful for special needs dogs that are not able to participate in group play. See Scott or Gail to set up an activities program custom designed for your dog. We are happy to work with you and your veterinarian on physical rehabilitation after injuries or surgery. Socialization outings are also available for puppies that need to see more of the world while they are still young. This is an essential step in raising a sound and confident dog.